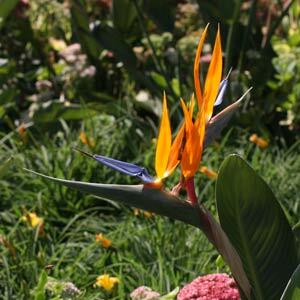 Used widely in landscaping as well as in home gardens, wholesale suppliers of Strelitzia or Bird of Paradise Plant can supply plants in a range of sizes from tube stock through to larger specimens in 100 litre bags. Smaller sizes are well suited to mass planting by landscapers, larger sizes can be used to provide instant impact in specialist design projects. Plants are available in a range of sizes from 300ml pots to 100L bags. The larger established sizes are well suited to landscapers who are looking for plants that will make an immediate impact. This is the most commonly grown form. Lower growing form than the species to around 1m, smaller flowers than the species. Large growing white flowering form to around 1.5 – 2m. Reaching up to 10m +, large tropical fronds and huge flowers. Grows well as far south as Melbourne, and with the huge fronds, brings a real tropical look to the garden. More gold in the flowers, to around 2m.